This year is going to be my biggest year yet at DragonCon! I’ll have a table in the artist alley, a large gallery bay, and a 3D display table in addition to all the rest! This will also be my first year giving a panel on the basics of leather mask-making (Saturday at 7pm during the con). I thought it would be a good exercise to share my tentative to-do list for this year’s con just to give everyone an idea of the hecticness. – Shoot and edit videos of segments for the mask-making demo. – Finish “War Prince” and “Lotus Dancer” paintings. – Craft 6 leather masks to add to the displays. – Create head displays for masks (touch up ones from last year that are damaged). 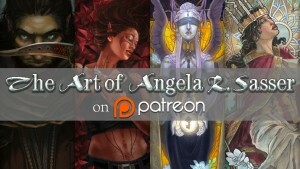 – Double mat 10 art cards and embellish each mat with a themed drawing. – Order canvas prints of centerpieces. – Order bookmarks (order vinyl sleeves and tassles for bookmarks). – Make sure I have enough bags and backing for all the prints. – Program barcodes for products at my table. Train with the new scanner between now and Dragoncon. – Compile portfolio for black and white interior artwork and full color character art for tabletop game companies. – Sign up for portfolio reviews. 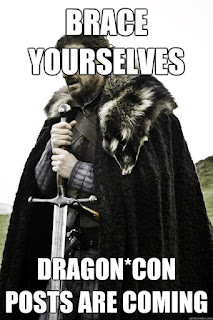 Still need to research which companies are represented at DragonCon and what kind of art they’re looking for. here on the blog just in case I lose it. To be honest, I’ve never pursued portfolio reviews at DragonCon before. It’s always been too intimidating and I never felt like I had enough of the right kinds of pieces. Now, I feel I have a better idea of what I am trying to be hired for and better work, to boot. We’ll see, though! I suspect I will be in for a cold splash of reality, but it’s one I hope that will help me to improve my presentation, overall! I’m also going to experiment with presenting my portfolio on an ipad. Yay for hand-me-down electronics! So let the mad rush begin! May the coffee flow free and the chocolate be plentiful!